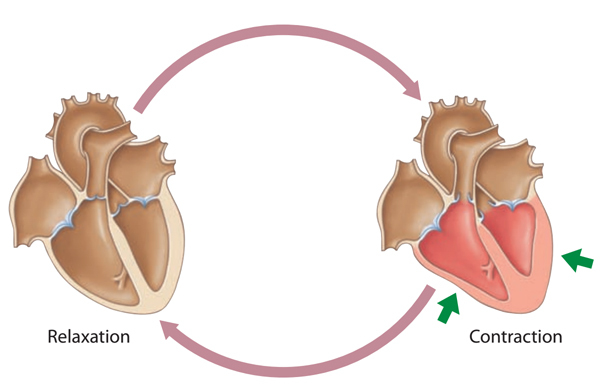 The cardiac cycle refers to the sequence of events that occur during one heartbeat. 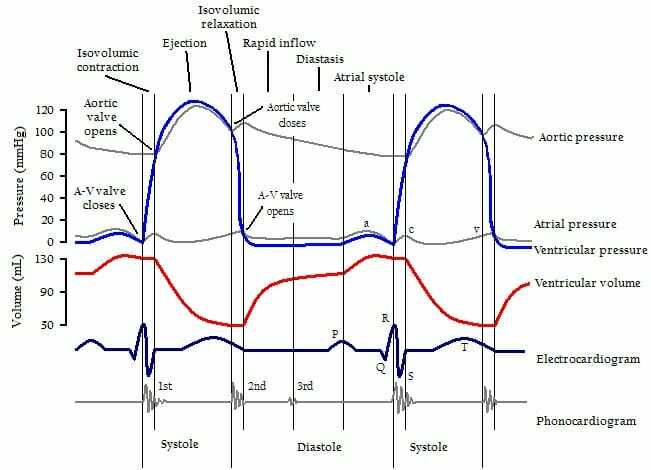 The contraction phase of a cardiac cycle is known as systole (sis ‘-to-le); the relaxation phase is called diastole (di ‘-as-to-le). During diastole the muscles of the heart relaxes and refills the blood after which systole takes place during which strong contraction and pumping of blood takes place. Note that the ventricles are relaxed when the atria contract, and the atria are relaxed when the ventricles contract. Systole increases blood pressure within a chamber, while diastole decreases blood pressure within a chamber. At the beginning of the cycle, when both the atria and ventricles are relaxed between beats, blood flows passively into the atrium from the superior and inferior venae cavae and the coronary sinus leading to the heart and then passively into the ventricles. After that the atria contracts (atrial systole), forcing more blood into the ventricles so that ventricles are filled. Immediately thereafter, the ventricles contract. Ventricular systole produces high blood pressure within the ventricles, which causes both AV valves to close and both semilunar valves to open. Opening of the semilunar valves allows blood to move into the arteries leading from the heart. Ventricular diastole immediately follows and the decrease in ventricle pressure allows the AV valves to open. Simultaneously, the semilunar valves close because of the greater blood pressure within the arteries. The cardiac cycle is then repeated. The sounds of the heart can be defined as the sound produced by a beating heart. Heart beats are usually described as lub- dup (pause) lub-dup, and so forth. These sounds are produced by the closing of the heart valves. The first sound results from the closing of the AV valves in the beginning of ventricular systole. The second sound results from the closing of the semilunar valves in the beginning of ventricular diastole. If any of the heart valves are defective and do not close properly, an additional sound, known as a heart murmur, may be heard.